The purpose of this study was to record the incidence and management of periprosthetic humeral fractures (PHF) using reverse total shoulder arthroplasty (RTSA) in our institution. We performed a retrospective study of 203 RTSA implanted in 200 patients between 2003 and 2014. The mean follow-up was 78.82 months (range, 12–141). Mean age of the study cohort was 75.87 years (range, 44–88). There were only 25 male patients (12.5 %). We assessed the presence of periprosthetic humeral fractures studying the medical files and X-rays of all patients. We identified seven periprosthetic humeral fractures in 203 RTSA (3.4 %): three intra-operative (1.47 %) and four post-operative (1.97 %). The average age at the time of the fracture was 75.14 years (59–83). All patients were women (100 %). Three patients with post-operative fractures type B were treated by osteosynthesis, and one patient with post-operative fracture type A was treated conservatively. All intra-operative fractures needed cerclage wire and in one case long cemented stem. All our periprosthetic fractures healed. 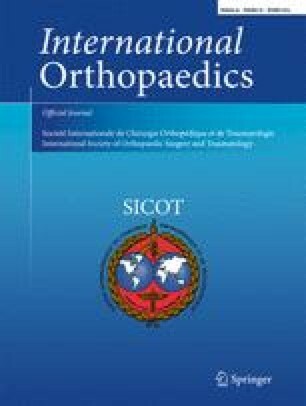 Surgical treatment with osteosynthesis in type B post-operative fractures with a stable stem is recommended. Conservative treatment is sufficient in non-displaced type A post-operative fracture. Special attention should be paid to bone quality patients using non-cemented stems in primary surgery but especially in revision shoulder surgery. This study received no outside funding.